data analysis | This is important. This past year I added some additional datasets to the Splunk environment I use to analyze my music: information about tickets that I’ve purchased, and information about upcoming concerts. I started keeping track of the tickets that I’ve purchased over the years, which gave me good insights about ticket fees associated with specific ticket sites and concert promoters. Based on the data that I’ve accumulated so far, Ticketmaster doesn’t have the highest fees for concert tickets. Instead, Live Nation does. This distinction is relatively meaningless when you realize they’ve been the same company since 2010. However, the ticket site isn’t the strongest indicator of fees, so I decided to split the data further by promoter to identify if specific promoters had higher fees than others. Based on that data you can see that the one show I went to promoted by AT&T had fee percentages of nearly 37%, and that shows promoted by Live Nation (through their evolution and purchase by Ticketmaster) also had fees around 26%. Shows promoted by independent venues have somewhat higher fees than others, hovering around 25% for 1015 Folsom and Mezzanine, but shows promoted by organizations whose only purpose is promotion tend to have slightly lower fees, such as select entertainment with 18%, Popscene with 16.67%, and KC Turner Presents with 15.57%. I realized I might want to refine this, so I recalculated this data, limiting it to promoters from which I’ve bought at least two tickets. It’s a much more even spread in this case, ranging from 25% to 11% in fees. However, you can see that the same patterns exist— for the shows I’ve bought tickets to, the independent venues average 22-25% in fees, while dedicated independent promoters are 16% or less in added fees, with corporate promoters like Another Planet, JAM, and Goldenvoice filling the middle of the data ranging from 18% to 22%. I also attempted to determine how I’m discovering concerts. This data is entirely reliant on my memory, with no other data to back it up, but it’s pretty fascinating to track. It’s clear that Songkick has become a vital service in my concert-going planning, helping me discover 46 shows, and friends and email newsletters from venues helping me stay in the know as well for 19 and 14 shows respectively. Social media contributes as well, with a Facebook community (raptors) and Instagram making appearances with 10 and 2 discoveries respectively. Because Songkick is so vital to my concert discovery, I wanted to amplify the information I get from the service. In addition to tracking artists on the site, I wanted to proactively gather information about artists coming to the SF Bay Area and compare that with my listening habits. To do this, I wrote a Songkick alert action in Python to run in Splunk. Songkick does an excellent job for the artists that I’m already tracking, but there are some artists that I might have just recently discovered but am not yet tracking. To reduce the likelihood of missing fast-approaching concerts for these newly-discovered artists, I set up an alert to look for concerts for artists that I’ve discovered this year and have listened to at least 5 times. To make sure I’m also catching other artists I care about, I use another alert to call the Songkick API for every artist that is above a calculated threshold. That threshold is based on the average listens for all artists that I’ve seen live, so this search helps me catch approaching concerts for my historical favorite artists. Also to be honest, I also did this largely so that I could learn how to write an alert action in Splunk software. Alert actions are essentially bits of custom python code that you can dispatch with the results of a search in Splunk. The two alert examples I gave are both saved searches that run every day and update an index. I built a dashboard to visualize the results. I wanted to use log data to confirm which artists were being sent to Songkick with my API request, even if no events were returned. To do this I added a logging statement in my Python code for the alert action, and then visualized the log statements (with the help of a lookup to match the artist_mbid with the artist name) to display the artists that had no upcoming concerts at all, or had no SF concerts. For those artists without concerts in the San Francisco Bay Area, I wanted to know where they were going instead, so that I could identify possible travel locations for the future. It seems like Paris is the place to be for several of these artists—there might be a festival that LAUER, Max Cooper, George Fitzgerald, and Gerald Toto are all playing at, or they just happen to all be visiting that city on their tours. I’m planning to publish a more detailed blog post about the alert action code in the future on the Splunk blogs site, but until then I’ll be off looking up concert tickets to these upcoming shows…. Disclaimer: I’m a Splunk employee, and I’m not a Cribl customer, but I do know the founders (including the author of the blog post). I figured I’d write this exploration up here rather than as an exceedingly-long Twitter thread. My reactions are all to the content of the blog post, not actual use of the product. If I’m reading this blog post from Cribl correctly, their product makes it easy to enrich events with metadata at ingest-time. This is relevant/exciting for me because when I’m ingesting music data for my side project, I’m only ever getting the initial slice that’s available from a specific REST endpoint or in a file. I’ve been identifying and collecting additional data sources that I want to enrich my dataset with, but doing so requires extra calls to other endpoints in the same API, or other web services, which means I then need to figure out where I want to store all of that data. It quickly turns into an architectural and conceptual headache that I delay handling, because I know I’d either be dumping a lot of data into lookups / the KV store, or having to seriously level up my Python skills and do data processing and enrichment in my code before sending it to Splunk Enterprise. As a specific example, I use the Last.fm getRecentTracks endpoint to send my listening data to Splunk Enterprise, but to enrich that data with additional metadata like track duration, or album release date, I’d have to hit 2 additional endpoints (track.getInfo and album.getInfo, respectively). Deciding when in the data processing pipeline to hit those endpoints, how to hit them, and where to store that information to enrich my events has been a struggle that I’ve been avoiding dealing with. There is an advantage to collecting the metadata once and storing it in a lookup or the KV store, because the metadata is relatively static. That means that it is relatively straightforward to call an endpoint, collect the data, and store it somewhere for when I need it. That means that I then have the added flexibility to enrich my events with extra data at search time when I want to, but not otherwise. However, this means that I’m having to make conceptual decisions at multiple points—when collecting the data, when deciding what format to store it in, and where, and when I am enriching events at search time. It’s a lot of added complexity, but this type of enrichment doesn’t affect the size of my originally-indexed events, though it might end up being indexed separately instead. But with Cribl’s solution, I’d be making that choice once. That does mean I lose potential flexibility about when and which events I can enrich with the data, but it also means that the conceptual decisions aren’t something I have to belabor. I can enrich my listening data at ingest-time with additional metadata about the album, artist, and track, then send it on to be indexed. Then when I’m searching and want to perform additional work with the metadata, it’s all right there with my events already. This is a convenient, if imperfect, solution for my use case. But my use case is pretty basic: enrich events with static information that might be shared across many events. That’s a use case with a lot of potential solutions. I could use this approach if I didn’t care about reducing the amount of data that I indexed to the bare minimum, and focused instead on convenience and context for my data ingestion, allowing me to save time when searching my data. This solution is much more exciting for use cases other than mine, where you’re enriching events with dynamic information that is relevant and true for specific events at index-time. The blog post includes an example of this, combining the web access logs with context from proxy logs, making the time-to-discovery for investigations that use web access logs shorter. There is flexibility in combining data at search time, but there is complexity with that approach as well. Cribl shows that there is convenience in creating that context at index-time as well. The annual Noise Pop music festival starts this week, and I purchased a badge this year, which means I get to go to any show that’s a part of the festival without buying a dedicated ticket. That means I have a lot of choices to make this week! I decided to use data to assess (and validate) some of the harder choices I needed to make, so I built a dashboard, “Who Should I See?” to help me out. First off, the Wednesday night show. Albert Hammond, Jr. of the Strokes is playing, but more people are talking about the Baths show the same night. Maybe I should go see Baths instead? If I’m making my decisions purely based on listen count, it’s clear that I’m making the right choice to see Albert Hammond, Jr. It is telling, though, that I’ve listened to Baths more recently than him, which might have contributed to my indecision. The other night I’m having a tough time deciding about is Saturday night. Beirut is playing, but across the Bay in Oakland. Two other interesting artists are playing closer to home, Bob Mould and River Whyless. I wouldn’t normally care about this so much, but I know my Friday night shows will keep me busy and leave me pretty tired. So which artist should I go see? It’s pretty clear that I’m making the right choice to go see Beirut, especially given my recent renewed interest thanks to their new album. Because I don’t need to make this decision for Noise Pop artists, I picked a few that I’ve been wanting to see lately: Lane 8, Luttrell, and The Rapture. While my interest in Lane 8 has spiked recently, there still aren’t enough cumulative listens to put them over the threshold. Same for Luttrell. However, The Rapture has enough to put me over the threshold (likely due to the fact that I’ve been listening to them for over 10 years), so I should go to the concert! I’m going to see The Rapture in May, so I am gleefully obeying my eval statement! On a more digressive note, it’s clear to me that this evaluation needs some refinement to actually reflect my true concert-going sentiments. Currently, the threshold averages all the listens for all artists that I’ve seen live. It doesn’t restrict that average to consider only the listens that occur before seeing an artist live, which might make it more accurate. That calculation would also be fairly complex, given that it would need to account for artists that I’ve seen multiple times. However, number of listens over time doesn’t alone reflect interest in going to a concert. It might be useful to also consider time spent listening, beyond count of listens for an artist. This is especially relevant when considering electronic music, or DJ sets, because I might only have 4 listen counts for an artist, but if that comprises 8 hours of DJ sets by that artist that I’ve listened to, that is a pretty strong signal that I would likely enjoy seeing that artist perform live. I thought that I’d need to get direct access to the MusicBrainz database in order to get metadata like that, but it turns out that the Last.fm API makes some available through their track.getInfo endpoint, so I just found a new project! In the meantime I am able to at least calculate duration for tracks that exist in my iTunes library. I now have a new avenue to explore with this project, collecting that data and refining this calculation. Reach out on Twitter to let me know what you might consider adding to this calculation to craft a data-driven concert-going decision-making dashboard. If you’re interested in this app, it is open sourced and available on Splunkbase. I’ll commit the new dashboard to the app repo soon! This past year has been pretty eventful in music for me. I’ve attended a couple new festivals, seen shows while traveling, and discovered plenty of new bands. I want to examine the data available to me and contrast it with my memories of the past year. I’ve been using Splunk to analyze my music data for the past couple years. You can learn more about what I’ve learned from that in the past in my other posts, see Reflecting on a Decade of Quantified Music Listening and Best of 2017: Newly-Discovered Music. 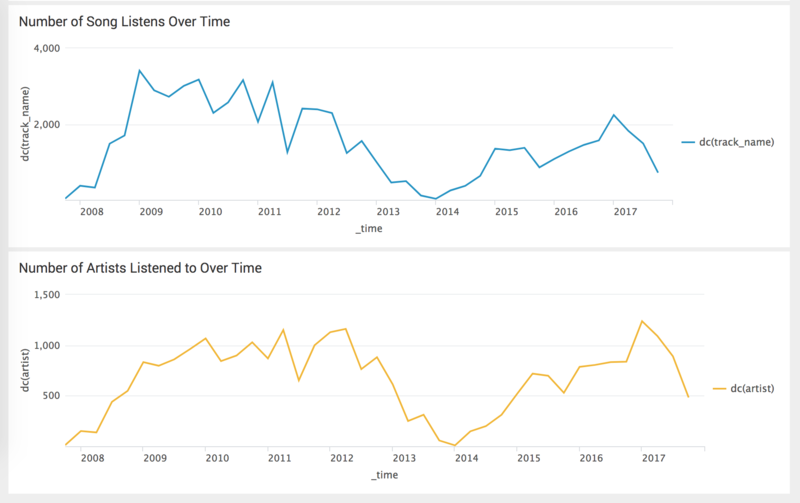 I also wrote a blog post for the Splunk blog (I work there) about this too: 10 Years of Listens: Analyzing My Music Data with Splunk. Spotify released its #2018wrapped campaign recently, sharing highlights from the year of my listening data with me (and in an ad campaign, aggregate data from all the users). As someone that uses Spotify but not as my exclusive source of music listening, I was curious to compare the results with my holistic dataset that I’ve compiled in Splunk. Spotify’s top artists for me were somewhat different from the results that I found from the data I gather from Last.fm and analyze with Splunk software. Spotify and my holistic listening data agree that I listened to Poolside more than anyone else, and was also a big fan of Born Ruffians, but beyond that they differ. This is probably due to the fact that I bought music and when I’m mobile I switch my primary listening out of Spotify to song files stored on my phone. In addition, my top 5 songs of the year were completely different from those listed in Spotify. My holistic top 5 songs of the year were all songs that I purchased. I don’t listen to music exclusively in Spotify, and my favorites go beyond what the service can recognize. Spotify identified that I’ve listened to 30,473 minutes of music, but I can’t make a similarly reliable calculation with my existing data because I don’t have track length data for all the music that I’ve listened to. I can calculate the number of track listens so far this year, and based on that, make an approximation based on the track length data that I do have from my iTunes library. The minute calculation I can make indicates that I’ve so far spent 21,577 minutes listening to 3,878 of the 10,301 total listens I’ve accumulated so far this year (Numbers to change literally as this post is being written). I’m similarly lacking data allowing me to determine my top genre of the year, but Indie is a pretty reliable genre for my taste. I was able to calculate my Top 10 artists, songs, and albums of the year, and drill down on the top 10 artists to see additional data about them (if it existed) in my iTunes library, like other tracks, the date it was added, as well as the kind of file (helping me identify if it was purchased or not), and the length of the track. There are quite a few common threads across the top 10 artists, songs, and albums, with Poolside, Young Fathers, Gilligan Moss, The Vaccines, and Justice making consistent appearances. The top 10 songs display obsessions with particular songs that outweigh an aggregate popularity for the entire album, leading other songs to be the top albums of the year. Interestingly, the Polo & Pan album makes my top 10 albums while they don’t make it to my top 10 artist or song lists. This is also true for the album Dancehall by The Blaze. I’m not much of an album listener usually, but I know I listened to those albums several times. The top 10 song list is more dominated by specific songs that caught my attention, and the top 10 artists neatly reflect both lists. The artists that have a bit more of a back catalog also reveal themselves, given that Born Ruffians managed to crack the top 10 despite not having any songs or albums make the top 10 lists, and Hey Rosetta! makes the top artist and album lists, despite having no top songs. I purchased 285 songs this year, an increase of 157 compared to the year before. I think I just bought songs more quickly after first hearing them this year, and there are even some songs missing from this list that I bought on Beatport or Bandcamp because they weren’t available in the iTunes Store. While I caved in to Spotify premium this year, I still kept up an old promise to myself to buy music (rather than acquire it without paying for it, from a library or questionable download mechanisms) now that I can afford it. I’ve been to a lot of concerts so far this year. 48, to be exact. I spent a lot of money on concert tickets, both for the shows I attended this year and for shows that went on sale during 2018 (but at this point, might be happening in 2019). I often will buy tickets for multiple people, so this number isn’t very precise for my own personal ticket usage. I managed to go to at least 2 concerts every month. By the time the year is over, I’m on track to go to 51 different shows. Based on the statistics, there are some months where I went to many more than 1 show per week, and others where I didn’t. Especially apparent are the months with festivals—February, August, and October all included festivals that I attended. Many of those festivals brought me to new-to-me locations, with the Noise Pop Block Party and Golden Gate Park giving me new perspectives on familiar places, and Lollapalooza after shows bringing me out to Schubas Tavern for the first time in Chicago. If you’re reading this wondering what San Francisco Belle is, it’s a boat. That’s one of several new venues that electronic music brought me to—DJ sets on that boat as part of Goldroom and Gigamesh’s tour, plus a day party in Bergerac and a nighttime set at Audio other times throughout the year. Some of those new venue locations brought newly-discovered music to me as well. The 20th-most-popular artist I discovered this year was Jenn Champion, who opened for We Were Promised Jetpacks at their show at the Great American Music Hall. I started writing this assuming that I hadn’t heard Jenn Champion before that night, but apparently I first discovered them on July 9, but the show wasn’t until October 9. As it turns out, I listened to what is now my favorite song by Jenn Champion that day in July, likely as part of a Spotify algorithm-driven playlist (judging by the listening neighbors around the same time) but it didn’t stick until I saw them play live months later. The vagaries of playlists that refresh once a week can mean fleeting discoveries that you don’t really absorb. Because of how I can search for things in Splunk, I was also curious to see what others songs I heard when I first discovered Hubert Kirchner, a great house artist. I have really no idea what playlist I was listening to that might have led to me making jumps from Sofi Tukker, to Tanlines, to Dion, to Deradoorian, then to Hubert Kirchner, Miguel, How to Dress Well, Rihanna, Selena Gomez, and Descendents. Given that August 24th was a Friday, my best guess is perhaps that it was a Release Radar playlist, or perhaps an epic shuffle session. For the top 20 bands I discovered in 2018, many of them I started listening to on Spotify, but not necessarily because of Spotify. Gilligan Moss was a discovery from a collaborative playlist shared with those that are also in a Facebook group about concert-going. I later saw them at one of the festivals I went to this year, and it even turned out that a friend knew one of the band members! Their status as my most-listened-to discovery of this year is very accurate. Polo & Pan was a discovery from a friend, fully brought to life with a playlist built by Polo & Pan themselves and shared on Spotify. Spent some quality time sitting in a park listening to that playlist and just enjoying life. They were at the same festival as Gilligan Moss, playing the same day, making that day a standout of my concerts this year. Similarly, Luxxury was a DJ I first spotted on a cruise that I went on because it featured other DJs I had heard of from college, Goldroom and Gigamesh, whom I’d discovered through remixes of songs I downloaded from mp3 blogs like The Burning Ear. Many of these discoveries were deepened by Spotify, or had Spotify as a vector—through a collaborative playlist, algorithmically-generated one, or the quick back-catalog access for a new artist—but don’t rely on Spotify as a platform. I prefer to keep my music listening habits platform-adjacent. Spotify, SoundCloud, iTunes, Beatport and other music platforms I use help make my music experiences possible. But the artists making the music, performing live in venues that I have the privilege to live near and afford to visit, they are creating what keep my mind alive and energized. The social platforms too, mediate the music-related experiences I’ve had, whether it’s with the people I share music and concert experiences with in a Facebook group, the people I exchange tracks and banter with in Slack channels, or those of you reading this on yet another platform. I like to listen to music that moves me, physically, or that arrests my mind and takes me somewhere. More now than ever I realize that musical enjoyment for me is an intense instantiation of the continuous tension-and-release pattern that exists in so many human art forms. The waves of neatness that clash and collide in a house music track, or the soaring crescendos of harmonies. It’s become clear to me over the years that I can’t separate my enjoyment of music from the platforms that bring me closer to it. Perhaps supporting the platforms in addition to the musical artists, performers, and venues, is just another element of contributing to a thriving music scene. I recently crossed the 10 year mark of using Last.fm to track what I listen to. From the first tape I owned (Train’s Drops of Jupiter) to the first CD (Cat Stevens Classics) to the first album I discovered by roaming the stacks at the public library (The Most Serene Republic Underwater Cinematographer) to the college radio station that shaped my adolescent music taste (WONC) to the college radio station that shaped my college experience (WESN), to the shift from tapes, to CDs, (and a radio walkman all the while), to the radio in my car, to SoundCloud and MP3 music blogs, to Grooveshark and later Spotify, with Windows Media Player and later an iTunes music library keeping me company throughout…. It’s been quite a journey. Some, but not all, of that journey has been captured while using the service Last.fm for the last 10 years. Last.fm “scrobbles” what you listen to as you listen to it, keeping a record of your listening habits and behaviors. 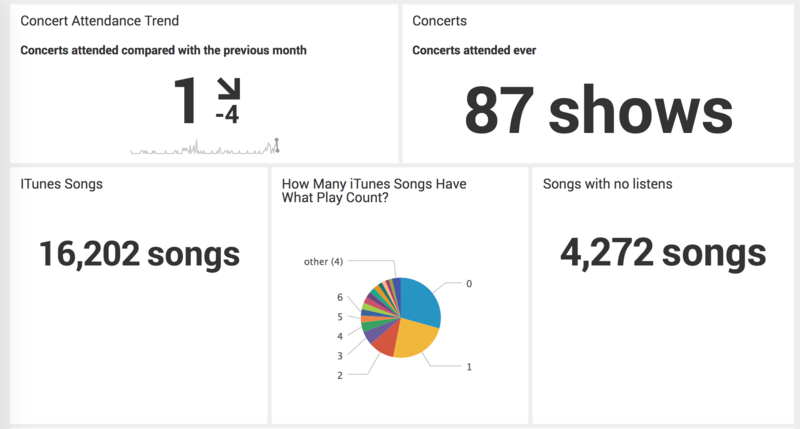 I decided to add all this data to Splunk, along with my iTunes library and a list of concerts I’ve attended over the years, to quantify my music listening, acquisition, and attendance habits. Let’s go. Before I get any data in, I have to know what questions I’m trying to answer, otherwise I won’t get the right data into Splunk (my data analysis system of choice, because I work there). Even if I get the right data into Splunk, I have to make sure that the right fields are there to do the analysis that I wanted. This helped me prioritize certain scripts over others to retrieve and clean my data (because I can’t code well enough to write my own). What percentage of the songs in iTunes have I listened to? What is my artist distribution over time? Do I listen to more artists now? Different ones overall? What is my listen count over time? What genres are my favorite? How have my top 10 artists shifted year over year? How do my listening habits shift around a concert? Do I listen to that artist more, or not at all? What songs did I listen to a lot a few years ago, but not since? What personal one hit wonders do I have, where I listen to one song by an artist way more than any other of their songs? What songs do I listen to that are in Spotify but not in iTunes (that I should buy, perhaps)? How many listens does each service have? Do I have a service bias? How many songs are in multiple services, implying that I’ve probably bought them? What’s the lag between the date a song or album was released and my first listen? What geographic locations are my favorite artists from? As the list goes on, the questions get more complex and require an increasing number of data sources. So I prioritized what was simplest to start, and started getting data in. I knew I wanted as much music data as I could get into the system. However, SoundCloud isn’t providing developer API keys at the moment, and Spotify requires authentication, which is a little bit beyond my skills at the moment. MusicBrainz also has a lot of great data, but has intense rate-limiting so I knew I’d want a strategy to approach that metadata-gathering data source. I was left with three initial data sources: my iTunes library, my own list of concerts I’ve gone to, and my Last.fm account data. Last.fm provides an endpoint that allows you to get the recent tracks played by a user, which was exactly what I wanted to analyze. I started by building an add-on for Last.fm with the Splunk Add-on Builder to call this REST endpoint. It was hard. When I first tried to do this a year and a half ago, the add-on builder didn’t yet support checkpointing, so I could only pull in data if I was actively listening and Splunk was on. Because I had installed Splunk on a laptop rather than a server in ~ the cloud ~, I was pretty limited in the data I could pull in. I pretty much abandoned the process until checkpointing was supported. After the add-on builder started supporting checkpointing, I set it up again, but ran into issues. Everything from forgetting to specify the from date in my REST call to JSON path decision-making that meant I was limited in the number of results I could pull back at a time. I deleted the data from the add-on sourcetype many times, triple-checking the results each time before continuing. I used a python script (thanks Reddit) to pull my historical data from Last.fm to add to Splunk, and to fill the gap between this initial backfill and the time it took me to get the add-on working, I used an NPM module. When you don’t know how to code, you’re at the mercy of the tools other people have developed. Adding the backfill data to Splunk also meant I had to adjust the max_days_ago default in props.conf, because Splunk doesn’t necessarily expect data from 10+ years ago by default. 2 scripts in 2 languages and 1 add-on builder later, I had a working solution and my Last.fm data in Splunk. To get the iTunes data in, I used an iTunes to CSV script on Github (thanks StackExchange) to convert the library.xml file into CSV. This worked great, but again, it was in a language I don’t know (Ruby) and so I was at the mercy of a kind developer posting scripts on Github again. I was limited to whatever fields their script supported. This again only did backfill. I’m still trying to sort out the regex and determine if it’s possible to parse the iTunes Library.xml file in its entirety and add it to Splunk without too much of a headache, and/or get it set up so that I can ad-hoc add new songs added to the library to Splunk without converting the entries some other way. Work in progress, but I’m pretty close to getting that working thanks to help from some regex gurus in the Splunk community. For the concert data, I added the data I had into the Lookup File Editor app and was up and running. Because of some column header choices I made for how to organize my data, and the fact that I chose to maintain a lookup rather than add the information as events, I was up for some more adventures in search, but this data format made it easy to add new concerts as I attend them. I built a lot of dashboard panels. I wanted to answer the questions I mentioned earlier, along with some others. I was spurred on by my brother recommending a song to me to listen to. I was pretty sure I’d heard the song before, and decided to use data to verify it. I’d first heard the song he recommended to me, Waiting on the Summer, in March. Hipster credibility: intact. Having this dashboard panel now lets me answer the questions “when was the first time I listened to an artist, and which songs did I hear first?”. I added a second panel later, to compare the earliest listens with the play counts of songs by the artist. Maybe the first song I’d heard by an artist was the most listened song, but often not. It’s pretty fun to look at this chart. I went to a few concerts while I was in high school, but never more than one a month and rarely more than a few per year. The pace picked up while I was in college, especially while I was dating someone that liked going to concerts. A slowdown as I studied abroad and finished college, then it picks up for a year as I get settled in a new town. But after I get settled in a long-term relationship, my concert attendance drops off, to where I’m going to fewer shows than I did in high school. As soon as I’m single again, that shifts dramatically and now I’m going to 1 or more show a month. The personal stories and patterns revealed by the data are the fun part for me. I answered some more questions, especially those that could be answered by fun graphs, such as what states have my concentrated music listens? It’s easy to tell where I’ve spent most of my life living so far, but again the personal details tell a bigger story. I spent more time in Michigan than I have lived in California so far, but I’ve spent more time single in California so far, thus attending more concerts. Speaking of California, I also wanted to see what my most-listened-to songs were since moving to California. I used a trellis visualization to split the songs by artist, allowing me to identify artists that were more popular with me than others. I really liked the CHVRCHES album Every Open Eye, so I have three songs from that album. I also spent some time with a four song playlist featuring Adele’s song Send My Love (To Your New Lover), Ariana Grande’s Into You, Carly Rae Jepsen’s Run Away With Me, and Ingrid Michaelson’s song Hell No. Somehow two breakup songs and two love songs were the perfect juxtaposition for a great playlist. I liked it enough to where all four songs are in this list (though only half of it is visible in this screenshot). That’s another secret behind the data. I also wanted to do some more analytics on my concert data, and decided to figure out what my favorite venues were. I had some guesses, but wanted to see what the data said. The Metro is my favorite venue in Chicago, so it’s no surprise that it came in first in the rankings (I also later corrected the data to make it its proper name, “Metro” so that I could drill down from the panel to a Google Maps search for the venue). First Midwest Bank Ampitheatre hosted Warped Tour, which I attended (apparently) 5 times over the years. Since moving to California it seems like I don’t have a favorite venue based on visits alone, but it’s really The Independent, followed by Bill Graham Civic Auditorium, which doesn’t even make this list. Number of visits doesn’t automatically equate to favorite. I could do data analysis like that all day. But what else do I learn by just looking at the data itself? I can tell that Last.fm didn’t handle the shift to mobile and portable devices very well. It thrives when all of your listening happens on your laptop, and it can grab the scrobbles from your iPod or other device when you plug it into your computer. But as soon as internet-connected devices got popular (and I started using them), listens scrobbled overall dropped. In addition to devices, the rise of streaming music on sites like Grooveshark and SoundCloud to replace the shift from MediaFire-hosted and MegaUpload-hosted free music shared on music blogs also meant trouble for my data integrity. Last.fm didn’t handle listens on the web then, and only handles them through a fragile extension now. Distinct songs and artists listened to in Last.fm data.But that’s not the whole story. I also got a job and started working in an environment where I couldn’t listen to music at work, so wasn’t listening to music there, and also wasn’t listening to music at home much either due to other circumstances. Given that the count plummets to near-zero, it’s possible there were also data issues at play. It’s imperfect, but still fascinating. I have a lot of songs in my iTunes library. I haven’t listened to nearly 30% of them. I’ve listened to nearly 25% of them only once. That’s the majority of my music library. If I split that by rating, however, it would get a lot more interesting. Soon. You can’t see the fallout from my own personal Music-ocalypse in this data, because the Library.xml file doesn’t know which songs don’t point to actual files, or at least my version of it doesn’t. I’ll need more high-fidelity data to determine the “actual” size of my library, and perform more analyses. I need more data in general, and more patience, to perform the analyses to answer the more complex questions I want to answer, like my listening habits of particular artists around a concert. As it is, this is a really exciting start. If you want more details about the actual Splunking I did to do these analyses, I’ll be posting a blog on the official Splunk blog. That got posted on January 4th! Here it is: 10 Years of Listens: Analyzing My Music Data with Splunk.